Sleeping in a hammock is good for your back. Great, in fact. Feel free to stop reading at this point, throw the mattress on the curb, drill a couple holes in your bedroom wall and start sleeping in a hammock right away. The problem with many mattresses is that they the firmer ones which tend to help alleviate back problems are often too rigid and uncomfortable for most people’s taste, and the softer ones that tend to be more comfortable, at least for the first few hours of night, are a large cause of many people’s back problems. 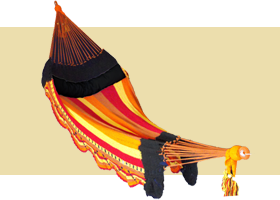 While no hammock is bad for your back, certain styles of hammock are better than others. American style rope hammocks won’t alleviate back pain as much as softer string, more flexible models. Additionally, the firm, unforgiving rope cords will dig into your back causing adding general discomfort to the back pain you already feel.